Dark Emu Black Seeds: agriculture or accident? is a short, sharp challenging book. Not challenging because it is difficult to read – far from it – but challenging in the way it undermines everything we thought we ‘knew’ about Aboriginal land management before white settlement. 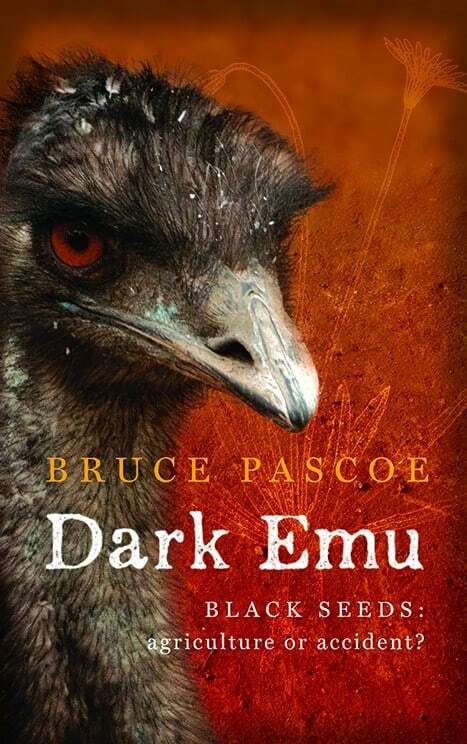 Dark Emu is an evocative title but the text is in fact illuminating, both for the light it sheds upon Aboriginal labour, agriculture and ingenuity and for its exposure of white people’s willful blindness. Pascoe builds on the work of Bill Gammage’s Greatest Estate on Earth (another text I highly recommend) but goes much further. Over and again, the early colonists recorded the existence of Aboriginal crops, food stores, houses, wells, irrigation systems and fisheries. Then, almost in the next breath, those same colonists exclaimed how the land was just there for the taking. Another early white colonist of Victoria, James Kirby, went so far as to describe the ingenuity and skills that were demonstrated by the Aborigines and then to dismiss their labour-saving activities as sheer laziness. Pascoe captures the inconsistency beautifully and is worth quoting from Black Emu in full (pages 14-15). Kirby saw a man, who must have known he was being watched, casually demonstrate a fishing method demonstrably better than that used by the whites. But Kirby, blinded by prejudice, was absolutely determined to see only what he wanted to see. He was not alone. Pascoe provides example after example of this kind of wilful blindness. Almost as an afterthought Pascoe also explores the similarly wilful excision of Aboriginal land management, Aboriginal culture and Aboriginal exterminations from white history. Many early whites had positive interactions and relationships with Aborigines but, in order to occupy their land, those whites had to think of the Aborigines as inferior, nomadic, and even not quite human. To acknowledge anything else would be to invite the question – what right have I to be here? The Macarthur family were a perfect example of the dissonant relationship between black and white. John and Elizabeth were Georgian English colonists who genuinely believed the land was theirs for the taking. They had no sense of the extent of their own ignorance in the face of Aboriginal law, land management and custom. Yet John and Elizabeth were not unkind. With Governor Phillip they had dined with Aborigines at Government House and would later continue to do so in their own home. It seems that at one stage they may even have adopted or fostered a young Aboriginal boy. In the history I learned at school, such as it was, the Aborigines were simply assumed to have melted away and disappeared. Of course, we now know better – or do we? One particular passage in Dark Emu made me gasp. 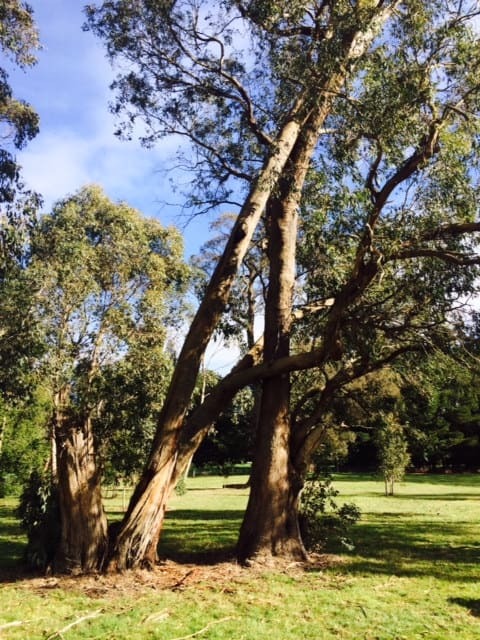 I have a tree like that in my back paddock (see photo at right). The kids call it the Hugging Tree. All of the others in that paddock (and there are many) grow straight and tall and I can’t tell you if my tree was deliberately shaped or not. But I can tell you that Dark Emu has opened my eyes to the possibilities of my own wilful blindness. Hi Michelle. Thanks for your great review of Dark Emu. We are really pleased that the momentum for the book is continuing to build. We have a (sadly neglected) blog for Dark Emu, so I hope you don’t mind if we share it on our blog too. Bruce will be thrilled. Happy to share the love! Go right ahead. Another great, thoughtful review and commentary on Dark Emu. Keep the momentum building!